Unlike the USA where inspection after construction is the primary requirement where a standard is law (a standard which is law is known as code), across Canada ASME boiler, pressure vessel, piping code is law everywhere, and any pressure equipment design not exempt from province/territory (jurisdiction) acts/regulations/director’s orders/minister’s orders/etc, must be submitted for approval to a Canadian appointed jurisdictional regulatory authority prior to construction. This approval is referred to as a Canadian Registration Number (CRN number) and it applies to both pressure systems and system pressure components. Licensed professional engineers experienced in pressure equipment design who are not authorized by the regulatory authorities to issue a CRN are not permitted to authorize regulated designs for construction without a CRN application having been made. Inspection after construction and CRN number approval is also required across Canada. 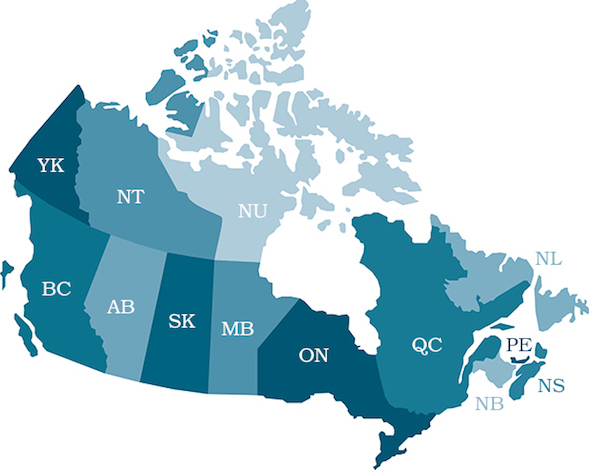 Although NB-370 covers Canadian & USA jurisdictions, due to the significant difference between Canadian and USA systems of pressure safety laws, rules & regulations, the above map is provide as a supplement for Canada. Unlike the USA, there is currently no government or safety authority resource to our knowledge that consolidates the Canadian pressure regulatory scene. By clicking on the jurisdiction in the above map you will be taken to a page with further information about its requirements. Finally, although the preceding makes mention of ASME, other pressure equipment and piping standards / codes are law in Canada such as American Petroleum Institute standards, and CSA standards to name a few. Be sure to check with the chief inspector / regulator/ safety authority in the jurisdiction that pressure equipment is intended to be used. Users are advised some references to legislative text have been rewritten to clarify certain regulations and make phrases and terminology more uniform or concise. Additionally, some references have been edited to remove redundancies and ambiguities. Users are reminded each synopsis is only a brief outline or distillation of a specific jurisdiction’s laws, rules, and regulations. In order to avoid misinterpretation of the data or failing to address the regulatory nuances of an individual jurisdiction, users are advised to consult the jurisdiction’s chief inspection officer before reaching any decision that may have critical consequences. Titan Research Group, its members, and employees assume no liability for the use or misuse of the information herein. Remember, the above is NOT comprehensive, and links may break from time to time. Be sure to consult the respective jurisdictional regulator, and their employees for up to date, accurate & authoritative (pun intended) information.